Click here to download the Arts information pamphlet. This course requires students to engage in dramatic processes and the presentation of dramatic works, and emphasizes the application of drama skills in other contexts and opportunities. Students will interpret and present works in a variety of dramatic forms, create and script original works, and critically analyse the processes involved in producing dramatic works. Students will develop a variety of skills related to collaboration and the presentation of dramatic works. This course requires students to experiment individually and collaboratively with forms and conventions of both drama and theatre from various cultures and time periods. Students will interpret dramatic literature and other text and media sources while learning about various theories of directing and acting. Students will examine the significance of dramatic arts in various cultures, and will analyse how the knowledge and skills developed in drama are related to their personal skills, social awareness, and goals beyond secondary school. This course requires students to experiment individually and collaboratively with forms and conventions of both drama and theatre from various cultures and time periods. In this course, students will learn about theatre practice and stagecraft by directing theatre pieces. Students will also interpret dramatic literature, media sources, and other texts while exploring various theories of directing. Students will examine the significance of dramatic arts in various cultures and will analyse how the knowledge and skills developed in drama are related to their personal development, social awareness, and long-term goals. Offered every other year. Not offered 2019-2020. This course focuses on the development of the voice as an instrument of expression. Students will be involved in multipart singing of various secular vocal music. Emphasis will be placed on popular music from the 20th century. Further concentration is based on small ensemble and solo performances, listening skills, music history and theory. This course will focus on the development of the voice as an instrument of expression with an emphasis on music of the 20th Century in solo and part singing. This course emphasizes the appreciation, analysis and performance of various kinds of music including baroque and classical music, popular music, and Canadian and non Western music. 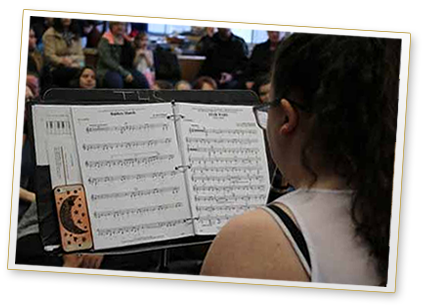 Students will perform technical exercises and appropriate repertoire, complete detailed creative activities, and analyze and evaluate live and recorded performances. They will continue to increase their understanding of the elements of music while developing their technical and imaginative abilities. This course is a continuation of AMV3M1. Emphasis is placed on further development of the voice through small ensemble, solo singing and sight singing. Both sacred and secular genres will be explored. This course focuses on the development of basic chord and picking techniques for the beginner on the acoustic guitar. Further concentration is based on small ensemble and solo performances, listening skills, music history and theory. Emphasis will be placed on Classical, Blues and Rock and Roll music. Students must supply their own acoustic guitar. This course is designed for the music student who is intent on advancing their repertoire and level of playing skill and technique through a focus on the further development of chord and picking techniques as well as creation through song writing and sound recording. This course emphasizes the appreciation, analysis and performance of various kinds of music including Classical, Blues and /Rock and Roll music. Students must supply their own guitar. This course is exploratory in nature, offering an overview of visual arts as a foundation for further study. Students will become familiar with the elements and principles of design and the expressive qualities of various materials by using a range of media, processes, techniques, and styles. Students will use the creative and critical analysis processes and will interpret art within a personal, contemporary, and historical context. Units include projects in lino block printing, building in clay, use of the glass fusing kiln, as well as exposure to traditional materials such as charcoal, pastel, paint, pen and ink. This course enables students to develop their skills in producing and presenting art by introducing them to new ideas, materials, and processes for artistic exploration and experimentation. Students will apply the elements and principles of design when exploring the creative process. Students will use the critical analysis process to reflect on and interpret art within a personal, contemporary, and historical context. Units include water colour, extended clay projects, acrylic painting on masonite and/or canvas, portrait studies, use of the fused glass kiln and a personal sketchbook. This course focuses on studio activities in the visual arts, such as drawing, painting, sculpture, photography, printmaking, collage, and/or multimedia art. Students will use the creative process to create art works that reflect a wide range of subjects and will evaluate works using the critical analysis process. Students will also explore works of art within a personal, contemporary, historical, and cultural context. Units include glass mosaics, portrait busts in clay, acrylic painting on stretched canvas, throwing on the wheel, figure drawing and personal choice projects. This course enables students to further develop their knowledge and skills in visual arts. Students will use the creative process to explore a wide range of themes through studio work that may include drawing, painting, sculpting, and printmaking, as well as the creation of collage, multimedia works, and works using emergent technologies. Students will use the critical analysis process when evaluating their own work and the work of others. The course may be delivered as a comprehensive program or through a program focused on a particular art form (e.g. photography, video, computer graphics, information design). 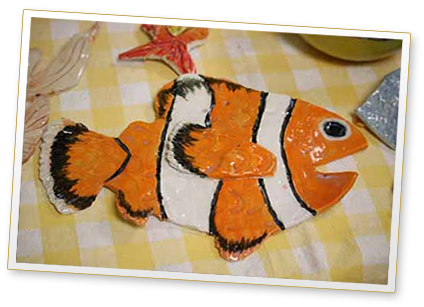 Units include glass mosaics, portrait busts in clay, acrylic painting on stretched canvas, throwing on the wheel, figure drawing and personal choice projects. This course is hands-on! Projects involve using clay to build both functional and decorative objects. Students will use various hand building methods and will also try throwing on the wheel. The use of armatures and different types of clay will allow large structures to be built with stability. Our kiln has the capacity to fire large projects and to allow experiments in the application of glazes. Other surface treatments and patinas will be explored. A visual notebook/sketchbook will be kept by the students. Art history studies will focus on the development of world ceramics. This course is an introduction to digital photography and will immerse students in the art of photography and the science of digital image manipulation. Individual projects may be based on personal themes or school-based events as students are encouraged to use photography, shoot their own videos and learn how to use the new graphic tablets to enhance the visual products. Students also learn how the principles of good visual design and layout can enrich their images. By using photography as a vehicle, students will examine how art, communication and technology are integrally related. This course combines study in drawing and painting with other non-traditional art forms, enabling students to refine their use of the creative process when creating and presenting two-and-three-dimensional artworks. Students will explore a range of materials, processes, and techniques that can be applied in their own art productions. Students will also make connections between various works of art in personal, contemporary and historical contexts. Offered every other year. Offered 2019-2020. This senior course focuses on artistic growth through drawing and painting. While portfolio work and finished projects are the target, there is considerable emphasis on image development and refinement through the use of a sketchbook and other preparatory work. Acrylics, water colour, canvas and masonite will be used as well as other less traditional means. Studies in art history cover Modern Art from 1880’s to the present. This course will provide senior students who formerly enjoyed Grade 11 Ceramics with an opportunity to build on skills for creating both functional and sculptural studio work at a more advanced level. Through this course there is ample opportunity to work toward developing a stronger portfolio for students who are interested in pursuing Visual Art at the post-secondary level. Projects are mostly student-driven. Drawing skill and art history knowledge will continue to be developed.